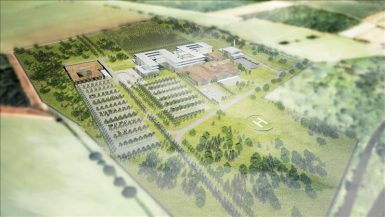 MJ Medical will lead the strategic health planning for a £150m critical treatment hospital in Hampshire, UK. The planned hospital is part of a new wave of dedicated emergency and critical treatment facilities planned to improve the delivery of acute emergency services. The new facility will serve a population of 600,000 people, centralising some specialised emergency services currently provided at other sites. Hampshire NHS Foundation Trust, one of the first in the UK to move towards this new model of centralised emergency care, appointed MJ Medical on the basis of their expertise and track record in clinical visioning and developing new models of care. The hospital is intended to deal with “blue light scenarios”, treating patients with major trauma injuries, heart attacks, strokes and other serious emergencies. Only the most critical patients will be treated at the hospital and will arrive by ambulance. The emergency departments at Basingstoke and Winchester will remain open and function as general A&E’s for patients to present themselves to. Working within a design team led by Stride Treglown Architects, (incorporating HASSELL Architects, Hoare Lea and Buro Happold), MJ Medical’s principle task is to assist in developing the vision for the delivery of medical care. They will then translate this into a clinical brief to aid the development of the design, develop an outline work force plan for the new facility, and go on to provide full medical equipment planning services for the detailed design stage. Work on the design is underway, with the new hospital currently scheduled for opening in December 2018.